These low, red hills fascinated Georgia O’Keeffe. Click on this link to see one of her paintings of this landscape. An O’Keeffe painting recently sold for $45 million. Detours can be the best parts of a journey. Our detour to Ghost Ranch Education and Retreat Center in northern New Mexico was a turning point in our trip, and a magical gateway to the American Southwest. I’d mentioned to my husband when we were driving through New Mexico that I wanted to see where Georgia O’Keeffe had lived and painted. Joe looked online and discovered that we could stay at Ghost Ranch. This juniper near O’Keeffe’s home, or one like it, inspired her painting, Gerald’s Tree. Now owned by the Presbyterian Church, Ghost Ranch attracts thousands of visitors a year who come here for spiritual retreats, art and music classes, yoga, outdoor adventures and trail rides, or as a temporary refuge if you’re passing through, as my husband and I were. Ghost Ranch is said to be haunted by spirits. It sure felt that way the night Joe and I arrived, in the dark, after driving up, up, and up on a twisting, turning road with many scary drop-offs. The welcome center had closed, and the staff had left our room key. We found our way in the dark and silence to the dorm, a no-frills adobe structure that had been staff quarters on this exclusive retreat for the wealthy in the 1920s and 1930s. You had to be invited to come to Ghost Ranch. Georgia O’Keeffe was famous by the time she finagled an invitation. Others who came were Charles Lindbergh’s family and the Robert Wood Johnson family, founders of Johnson & Johnson. The R.W. Johnson former home is now the library at Ghost Ranch. The Lindbergh’s wanted a secret, private escape, as this was after their infant son had been kidnapped. Charles flew over Ghost Ranch and developed its first aerial view map. Cerro Pedernal (flint hill), O’Keeffe’s favorite mountain, which she painted several times. Her ashes are scattered here. All was darkness as Joe and I made our way to our room, except for the stars. The Milky Way cut a huge swath in the sky. Ghost Ranch is said to be haunted by the spirits of the nomadic Native Americans that roamed here for thousands of years. Maybe, also, by the restless spirits of the cattle rustler brothers who, back in the day, hid stolen cattle in this box canyon and along the Chama River. Eventually, the two brothers had a falling out and one killed the other. The local townspeople came for the remaining brother and hung him from a tree that still stands on the property. Ghost Ranch has a herd of sheep descended from those brought by the Spanish hundreds of years ago. Their wool is sent to a local woolen mill. Our first morning at Ghost Ranch, my husband and I awoke to fluffy clouds that gave way to warm sunshine, which bathed a landscape of unusual rock formations and stunning mountains. The land glowed in hues of vermilion, ochre, gold, cream, and dusty brown. A typical fireplace. This is in the home of the cattle rustlers who originally inhabited Ghost Ranch land. It is now a museum. The staff and guides at Ghost Ranch were welcoming and knowledgeable. While Joe hiked up to the cliff chimneys, I took a guided tour of the ranch and a trip into the hillsides, where we saw many features of the terrain that Georgia O’Keeffe painted. Wendy, our tour guide, was an expert on O’Keeffe’s art and life. She had samples of the artist’s paintings that she showed us alongside the actual landscape subjects that so fascinated O’Keeffe. Georgia had her automobile outfitted as a portable studio and painted in the desert all day long. When it got too hot, she rested underneath her car. This is the casita that Georgia O’Keeffe lived in her first summer at Ghost Ranch. O’Keeffe’s world famous photographer husband, Alfred Stieglitz, never visited Ghost Ranch during the summers his wife stayed there. He remained in New York, where he was occupied with his career and his mistress. He and Georgia wrote 25,000 pages of letters to each other. Their relationship is a fascinating study of passionate love and how two great artists supported each other in their work. I also attended a church service in the chapel, where I met a retired chaplain and a minister who were from my home town. The couple had rented out their Cleveland condo and were spending the year living and volunteering at Ghost Ranch. Joe and I loved the home-cooked meals – breakfast, lunch, and dinner – in the Ghost Ranch dining hall, where you could meet and mingle with other guests who had come to take classes and watch the sun set in the evenings. This is an excellent biography of O’Keeffe by Roxana Robinson, a novelist whose fiction has been compared to the work of John Cheever. We were at Ghost Ranch just short of two days and didn’t have time to explore all its riches. The Catholic church in the nearby town of Abiquiu. 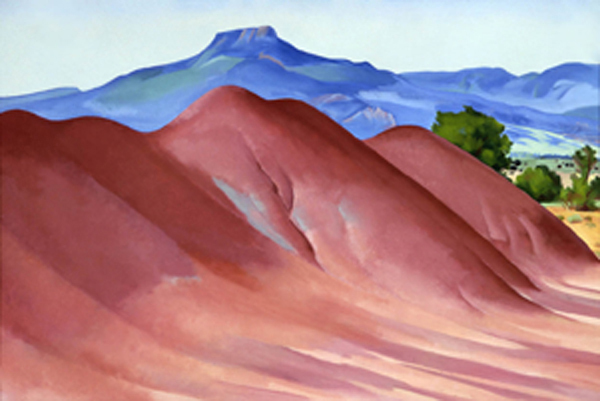 O’Keeffe had a home built on Ghost Ranch and then another in Abiquiu, which is now a museum. So we hope to return someday.